It's called Ruta del Cares or Divine Throat. 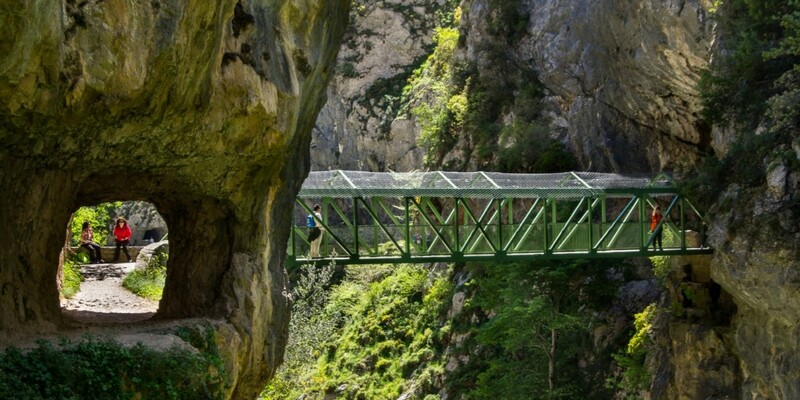 Channels that plunge precipitously from the heights to the cold waters of the river in an impossible road that runs 12 kilometers connecting Asturias with Leon the edge of a dramatic gorge that runs through the central and western massifs of the Picos de Europa. Civil engineering, the route home was in exclusive pastoral use. A winding and precarious path would make later on a path for the flow hydroelectric Cares and the transfer of agricultural products. Based open peaks and dynamite, was becoming with time in the tourist attraction of the area and is currently the busiest, a must for any lover of nature, mountain and rural tourism route of the peaks. A spectacular route offers hikers spectacular images of immense beauty. A comparable to the ease of its route, suitable for anyone who is willing to walk beauty. If you are willing, just keep in mind that the twelve kilometer round must perform them back because the road does not stop and start in the same place. The Ruta del Cares flies over the river, far below, it seems to cut the mountain like a cold knife creating beautiful and unique landscapes.